This post has been updated for 2017. Click here for where to take your sweetie this year. Valentine’s Day has the potential to be a fantastic opportunity to show your honey that you care about them, or a great breeding ground for a disagreement. Either way, it’s a beautiful thing that there is a special day each year devoted to love. For us at Bucks County Taste, the way to our hearts is through our stomachs, so our advice is to celebrate the holiday by taking advantage of one of the many delicious dinners being served in Bucks County. And for those of you who think the holiday is a bogus attempt for greeting card companies to sell cards and other trinkets, well, even cynics need to eat! Read on for some of the many special dinners and other fun events happening over the Valentine’s Day weekend (and make your reservations SOON, so you don’t find yourself in hot water). The Black Bass Hotel will have a three course prix fixe menu for $75 per person on Friday, February 13 or $85 per person on Friday, February 14. The menu includes their famous Charleston Meeting Street Crab and other standouts like a pecan herb-crusted rack of lamb and a homemade wild mushroom ravioli. See the full menu here. The Black Bass is at 3774 River Road, Lumberville. For reservations call 215.297.9260. Caleb’s American Kitchen will have a four course, prix fixe menu for $65 per person. Their special menu includes roasted lobster, beef filet, and pan seared sea bass filet. View the whole menu here. Caleb’s is located at 5738 Route 202, Lahaska, just on the outskirts of Peddler’s Village. Make your reservation by calling 215.794.8588. The Centre Bridge Inn will be serving a three course prix fixe dinner for $65 per person. They have a variety of seafood and steak options, as well as vegetarian choices. View the whole menu here. The Centre Bridge Inn is at 2998 North River Road, New Hope. Call 215.862.9139. Chambers 19 will have a four course dinner for $40 per person. Guests can choose from a special menu to fill out their four courses. Specials for the evening include a bacon-wrapped filet and crab imperial-stuffed lobster tail. See the full menu here. Chambers 19 is located at 19 North Main Street, Doylestown. Make your reservation by calling 215.348.1940. Fisher’s Tudor House is doing something different – they’ll be hosting a Valentine’s Day Murder Mystery Dinner on Friday, February 13 and Saturday, February 14. Fisher’s Tudor House is at 1858 Street Road, Bensalem. Make your reservation by calling 215.244.9777. The Golden Pheasant has a few events for the Valentine’s Day Weekend. For dinner, guests can choose from a prix fixe or a la carte menu; you can view the prix fixe menu here and the a la carte menu here. They’re also hosting a Valentine’s Day Brunch on Sunday, February 15. View the brunch menu here. [Just in: Saturday is full up, but Friday and Sunday are still available.] The Golden Pheasant is at 763 River Road, Erwinna. Call 610.294.9595. Hamilton’s Grill Room will have a four course prix fixe dinner complete with a champagne toast for $75 per person. View the menu here. They’ll also have a Valentine’s Day Sunday Brunch that includes a beverage bar, a grill station, an omelette station, a salmon station, a salad station, fresh breads, and dessert. Hamilton’s Grill Room is at 8 Coryell Street, Lambertville. Call them at 609.397.4343 to make reservations. The Hattery Stove & Still is hosting a four course prix fixe meal for $50 per person. Reservations are available Friday, February 13 through Sunday, February 15 for the holiday’s menu. They’ll have surf and turf, ricotta gnochi, and flourless chocolate torte, to name a few. See the full menu here. The Hattery Stove & Still is located at the site of the Doylestown Inn, 18 West State Street, Doylestown. Call 215.345.1527 for reservations. Martine’s RiverHouse Restaurant will have a prix fixe dinner for $189 per couple that includes a complimentary glass of Prosecco, Amuse Bouche, and a three course dinner. Martine’s is located at 14 East Ferry Street, New Hope. Make your reservation by calling 215.862.2966. McCoole’s at the Historic Red Lion Inn is having a Valentine’s Day Party with a buffet for $50 per person that includes prime rib, tortellini alfredo, and chicken cordon bleu, with a choice between bavarian apple tart or chocolate mousse for dessert. A Swinging Affair, a Frank Sinatra tribute band, will set the mood. McCoole’s is at the intersection of Broad and Main Streets in Quakertown. Call them at 215.538.1776 for for reservations. Na Brasa Brazilian Steakhouse is offering complimentary champagne and chocolate covered strawberries to go along with their usual Rodizio dinner. They have 15 cuts of meat and fish to choose from and 40 hot and cold salad bar options, so this should suit a wide variety of palates. Na Brasa is located at 680 North Easton Road, Horsham. Call them at 215.956.0600. 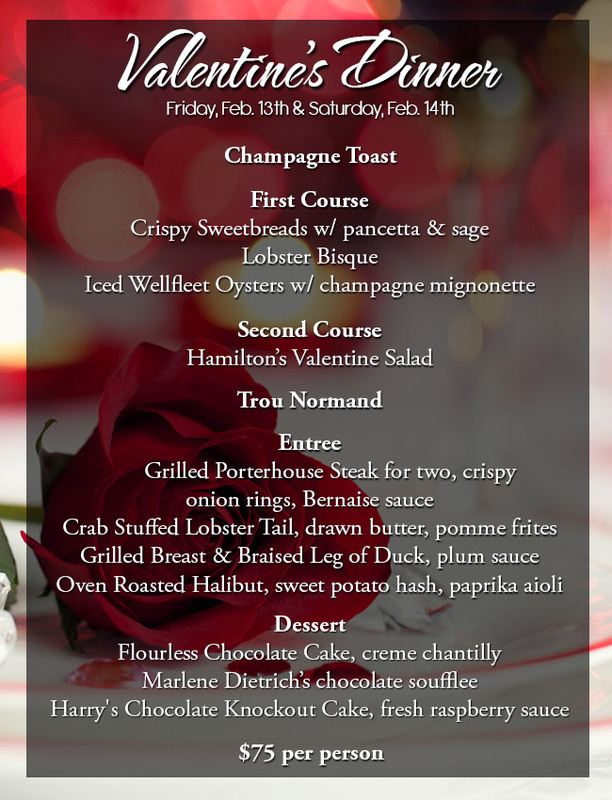 The Riegelsville Inn will serve a four course prix fixe dinner with complimentary sparkling wine for $65 per person. Steak, salmon, sea scallops, and roasted chicken breast are all on the menu, as well as a choice between chocolate hazelnut torte and strawberry cheesecake for dessert. The Riegelsville Inn is located at 10-12 Delaware Road, Riegelsville. Make your reservation by calling 610.749.0100. Triumph Brewing Company in New Hope is doing a Valentines Day Brunch on Sunday, February 15 for $30 per person. Each guest will receive a glass of Brunch Stout with their reservation. The buffet will feature an omelette station, pastries from The Bread Box and Bakery, french toast, Bespoke Bacon, roasted potatoes, fresh fruit, and much more. All non-alcoholic beverages (coffee, soda, juice and tea) are included. There will also be an a la carte Bloody Mary bar featuring garnishes like shrimp, olives, landjaeger, and celery. Triumph Brewing Company is at 400 Union Square Drive, New Hope. Call 215.862.8300 to make a reservation. Via Ponte in Stockton will have a five course dinner for $95 per person, accompanied by live entertainment. Via Ponte is located at 13 Bridge Street, Stockton, NJ. Make your reservations by calling 609.397.9397. The Washington Crossing Inn is offering a prix fixe three course meal for $59 per person. The Inn is located at 1295 General Washington Memorial Boulevard, Washington Crossing. Call them at 877.882.1776. The Yardley Inn will serve an al a carte menu including oysters on the half shell, organic salmon with passion fruit butter and braised lamb roulade. View the full menu here. The Yardley Inn is at 82 East Afton Avenue in Yardley. For reservations, call 215.493.3800. If you choose to go to any of these fine establishments, please tell them you heard about it on Bucks County Taste.